Once you create a new Page Layout and you click on "Save", additional Groups and Roles sections appear below the Save button. The Page Layout you have created can now be applied to a Group/s or a Role/s. When you create a Page Layout you need to click on "Save" at the bottom of the Form. When this is clicked additional sections appear for you to apply the Page Layout to a Group/s and/or to a Role/s. When you add in Group and/or a Role to the Groups and Roles sections of a Page Layout, each User that is in the Group (or if they are a coach of the group) or in the Role that you appy this Page Layout to will see this Page Layout (either when they view the group, or when they login). See the previous lesson to find out about applying a Page Layout to a Group. This lessons will review how to apply a Page Layout to a Role. It also reviews the priority of the Page Layouts displaying for a Group vs a Role. To open an Existing Page layout, you can click on the specific Page Layout from the Page Layout List. The Groups and Roles sections will then appear for you to enter. To apply a Page Layout to a Role add in a Role in the Roles Section. You can add a single Role at a time or select to add multiple and choose the Roles. You can apply a Page Layout to a Role. This means all of the Users in that Role will automatically see that Role's Page Layout when they login to their system. The example here shows the Coach Page Layout being assigned to the Coach Role. Any coaches in this Role will automatically have this layout when they login. 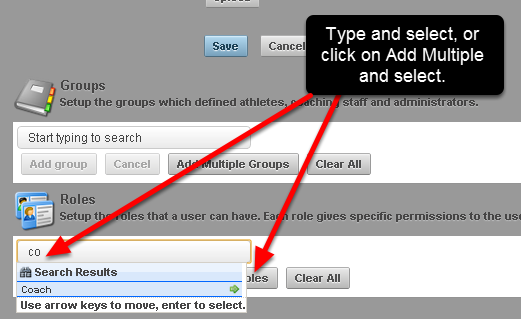 If you are a User in the Role you will see the Coach Page Layout when you login. Once you add in a Role (as show in the previous step), it is always best practice to click on the Role you have assigned the Page Layout to and check all of the User that will now have this new Page Layout to ensure you are happy with these users having this Layout. When you view the Coach Role, you can see that the Coach Page Layout now appears in this Roles' details. Open up the Role and double check that you want the Users in this Role to have this Page Layout. The Page Layout will appear as soon as any User from that Role logs in to the system. The image here shows the Page Layout that was set up for the Coach Role (this just an example and a Page Layout this ugly should never be used in practice!). Zoom: The Page Layout will appear as soon as any User from that Role logs in to the system. The image here shows the Page Layout that was set up for the Coach Role (this just an example and a Page Layout this ugly should never be used in practice!). This is the view when the Coach in the Coach Role logins in to the system. In the previous lesson (on assigning a Page layout to a Group), when a Page Layout was assigned to a Group, the Page Layout ONLY changed when the coach loaded a Group, or a Subgroup of a Group with a Page Layout applied to it. When you assign a Page Layout to a Role, this page layout will show as the theme for all Users in this Role from now on; as soon as they login. However, when a User in a Role that is assigned a Page Layout loads a group that ALSO has a Page Layout assigned to it, the Page Layout for the Group will appear instead of the Role Page Layout. Page Layouts assigned to a Group take Priority over Page Layouts assigned to a Role. 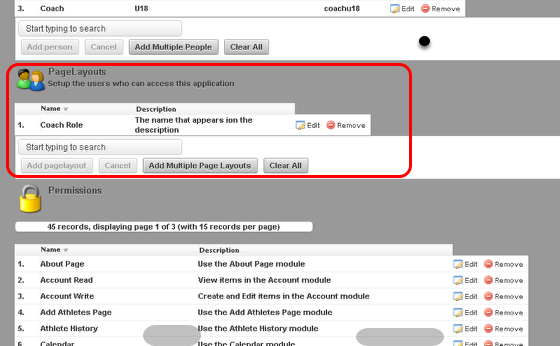 This means when a User in the Coach Role loads a group with no Page layout, the Coach Role Layout will be displayed. When they load any Groups that have a Page Layout, the Page Layout for that Group will be displayed. This is outlined in the steps below. WARNING: If a User is in Multiple Roles and each of these Roles has a different Page Layout assigned to it the software does not know which Page Layout takes priority. It will just pick ONE of these randomly and display it when the user logs in. Zoom: WARNING: If a User is in Multiple Roles and each of these Roles has a different Page Layout assigned to it the software does not know which Page Layout takes priority. It will just pick ONE of these randomly and display it when the user logs in. 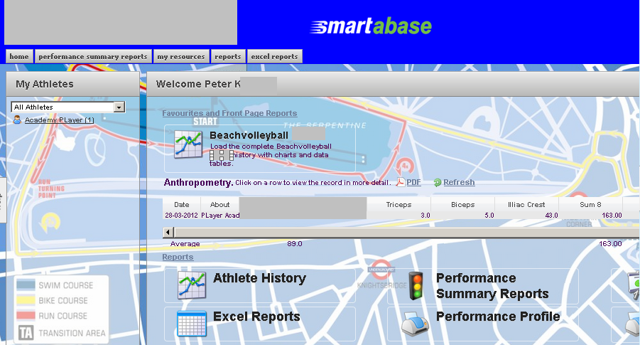 The example here shows a Coach's Home Page and the Talent ID Page Layout. This Coach is in the Coach AND Talent ID Manager Roles. Both of these Roles have been assigned a different Page Layout. 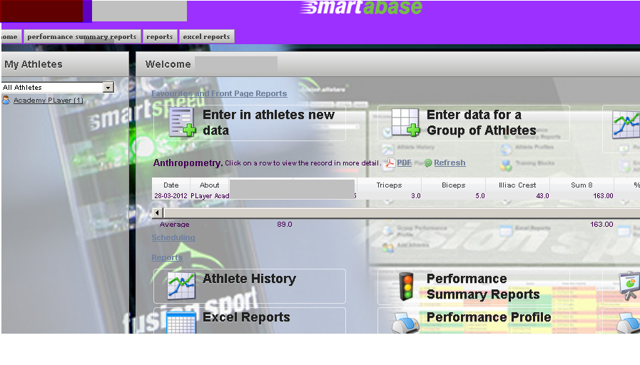 In the image previously, you saw that when a Coach who was only in the Role "Coach" logged into their system they saw the Coach Page Layout (purple header and the timing lights and ipad in the background image). Now when the coach logins you can see they the Page Layout is showing the Talent ID Page Layout (blue header and map in the background). Becasue there is no priority for which Role's Page Layout appears, the system will just select the most recently created Page layout and display it. You need to be very careful to ensure you apply the correct Page Layouts to the correct Roles, AND that you test which one will appear if you assign them to a User in multiple Roles. If in doubt, always test this layout on some test athletes/coaches first before you assign it to the actual Role/s. REMEMBER: Page Layouts applied to a Group are applied to any Subgroups in that Group. If the Subgroup has it's own Page Layout this will be displayed. Page Layouts Applied to a Group take Priority over Page layouts applied to a Role. Regardless of the Page Layout's assigned to any Roles that a User may have, if the User loads a Group with a Page Layout assigned to it, the Group's Page layout will show. 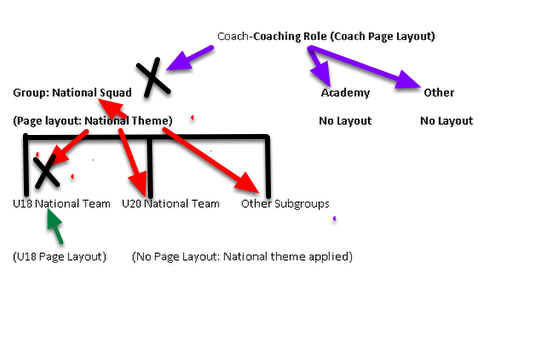 The example here shows that the Page Layout of the U18 National Team appears instead of the Coach Role or Talent ID Role Page Layouts (the Group's Layout takes priority). This is the view the Coach would see when looking at the U18 National Team (because it has it's own Page Layout). However, if the Coach changed to a different group like the Academy Group (as shown in the image in the step below), the Page layout will revert back to one of the Page layout's for the Roles that the Coach is in (as outlined in the steps below). The Coach is changing the view to the Academy Group. This Group is NOT a subgroup of a Group with a Page Layout and it does not have it's own Page Layout. The image here shows that a Page Layout was created for the Coaching Role. This means that when a user logs in who is in this Role, they will have this Page Layout display. When the Coach views the Academy Group, or any other group WITHOUT a Page Layout they will see the Coach Role Page Layout. One of the groups that the Coach has access to, the National Squad (which has the U20 National Team and the U18 National Team as subgroups), has it's own Page layout. Because Group Page Layouts take priority over Role Page Layouts, the Page Layout of the National Squad will show when the coach views the National Squad, or any subgroup of the National Squad. Similarly, the U18 National Team has it's own Page Layout. If the Coach selects to view this Group, the U18 Page Layout will appear. Next: Favourites NOT appearing in the Page Layout?